Wire harnessing services from SHINE are what you need for projects ranging from simple, two-wire assemblies to large, complex wire harnesses. The engineering support and help with component selection that we provide underscores our expertise in wire harness manufacturing. For over 30 years, SHINE has combined the power of automated wire harness manufacturing with an attention to detail that only trained personnel can provide. Through automated operations, SHINE promotes production speed and short lead times. 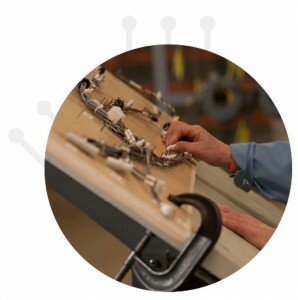 Through manual assembly, we create custom wire harnesses that meet your exact requirements. SHINE uses automated wire cutting, wire stripping, and wire terminating equipment to perform routine wire processing tasks. Then, by building your wire harnesses on custom-made harness boards, we match your part number and revision level. As an experienced provider of wire harnessing services, SHINE understands that your project’s success may require design assistance and help with component selection. So ask us for help with your wire harness layout, and we’ll gladly share what we’ve learned. SHINE can help you choose the right components for your wire harness, too. Ask us about connectors, terminals, tapes, and electric wires. We can also offer advice about sheaths, clamps, shield tapes, and convoluted loom. SHINE’s manufacturing center in Adams, Massachusetts is tooled to work with insulated terminals, non-insulated terminals, and OEM terminals. This is a partial list of wire manufacturers we that we support. Choosing the right wire harness manufacturer doesn’t have to be a difficult decision. When evaluating a contract manufacturer’s capabilities, it pays to review some examples of past projects. So check out the portfolio section of our website. From lead wire assembly to complete wire harnessing services, SHINE can meet your requirements. Do you have questions about wire harnessing services from SHINE? Did you know that SHINE’s capabilities, experience, and expertise also includes custom cable assembly and electro-mechanical assembly? Whether you’re ready for a quote or have a question about your specific application, we’d like to hear from you.